Auckland native Christiana Zhu proudly calls herself a ‘Chiwi’ (a Kiwi of Chinese ethnicity). She decided to move to China in 2014 to explore the Chinese market. Initially hired by WildChina for a project, she eventually stayed on as head of marketing. The move to Beijing significantly impacted her physical health. She developed allergies and severe eczema as her body adjusted to the air, environment, and food. In an effort to manage her allergies, triggered by severe lactose intolerance amongst other factors, she experimented with different solutions. She then discovered coconut milk based yogurt, which helped reduce her skin related issues. “My friend made coconut yogurt for me and taught me to make it for myself, as it wasn’t available anywhere in China, not even on Taobao. I wanted to share it with friends in the hope of opening their eyes and minds to new healthy options for people with food allergies in Beijing”, Christiana tells us. “I started taking it to parties and gatherings. It slowly got popular and then, urged by my supportive friends, I tried selling it at Farms to Neighbors farmers market. I really did not expect it to be such a huge hit. I sold out every single time and started getting we chat orders for the week”, she adds. There is a huge demand in Beijing for dairy free products, especially yogurts. Expanding to the Hatchery has helped with wider visibility for the yogurt. Christiana says that she hopes to combat the negative reputation that a lot of healthy foods often get in the taste department. When it comes to good taste, people often almost instinctively turn away from foods labelled “vegan”, “gluten free”, or “dairy free”, and she wants to change that, and show that these foods can also be fun and delicious. Coconut fat contains medium chain saturated fatty acids instead of long chain fatty acids, which makes it easier to digest, and because coconut oil is thermogenic it increases energy expenditure and can speed up metabolism, Christiana says. Furthermore, because coconut reduces inflammation it facilitates bowel movement. 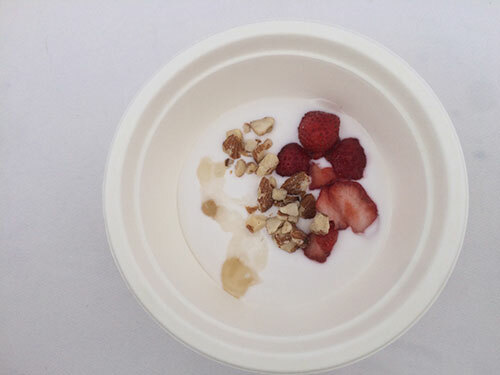 Christiana says that there are also three different strains of probiotics in the yogurt to support digestion. Lastly, the lauric acid in coconut milk boosts immunity and the calcium, minerals, essential fats, amino acids, and vitamins in the yogurt also helps maintain healthier hair, skin and bones, Christiana says, strengthening them through nourishment. Yeyo is only six months old and very much in its infancy. There’s no competition for her yogurt in the Beijing, especially because it’s also unsweetened yogurt, which is hard to find in China. She offers dairy free yogurt, with the consistency of a Greek style yogurt in three flavors every week. Two are standard, the pure yogurt and yogurt with a little bit of honey at the bottom. 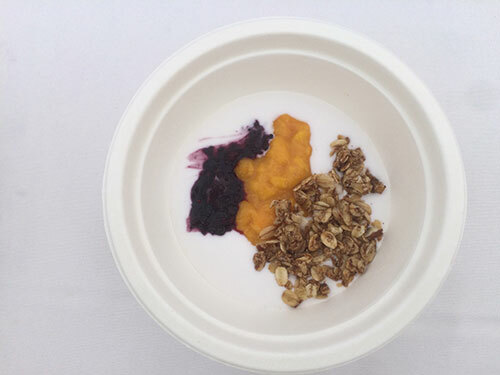 The third flavor varies every week, with seasonal fruit compote at the bottom to make it interesting. The yogurt comes in glass jars of 150ml for RMB 30 or a pack of four in a cooler bag for RMB 100. You can get a discount for recycling glass jars to reduce wastage. A delivery fee varies based on your location and it needs to be delivered to your door within an hour, for it to be fresh. It’s usually around RMB 16 for CBD area and RMB 24 for Shunyi. And that name? It’s simple. Yeyo comes from the Chinese words ‘ye’ for coconut and ‘yo’ for yogurt! Find Yeyo’s products at Farm to Neighbors Farmers Market every Saturday and Sunday, on sale at Hatchery, or order via Wechat (yeyo-yogurt). RMB 30-100. This article originally appeared on page 10 of the August 2016 Issue of beijingkids magazine. Click here for your free online copy. To find out how you can obtain a hard copy, contact distribution@truerun.com.